Bothrochilus boa is a medium size python species. 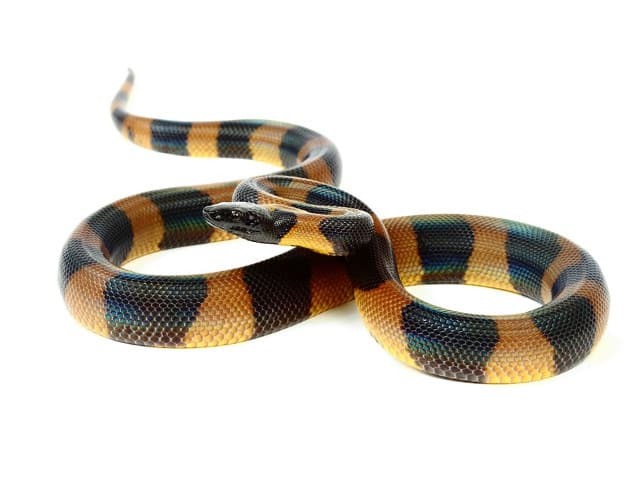 The color pattern consists of a series of brilliant orange and black rings in juveniles, but this fades in about a year as the snakes mature. Adults are usually a shade of golden brown with black rings, or a uniform blackish brown. Usually, there is a light spot behind the eye. Some specimens may have black rings that are irregular, incompletely formed or even absent. The scales are highly iridescent. I keep my Bothrochilus boa in 1.8 x 0.6 x 0.6 meters (6 x 2 x 2 feet) enclosures, due to their high humidity requirements it is essential that the enclosure is well sealed or preferably plastic. I kept my hatchlings in a 18 litre Really Useful Box, then upgrading to a 50 litre Really Useful Box at approximately 1 year of age. Once the python is around the 1 meter (3.5 feet) mark I move them into their larger 1.8 x 0.6 x 0.6 meters (6 x 2 x 2 feet) enclosures. I use natural logs and the foliage of the plants inside the enclosure to create natural hides. I use a natural deep substrate, which consists of soil, coco fibre, peat, leaf litter, orchid bark and sphagnum moss. I feel that this proves a great natural touch and enables them to burrow. It is important that the substrate is kept damp and not wet, wet substrate can lead to many health issues such as skin infections and will lead to a build up of bacteria. These pythons require the temperature to be a little cooler than most other pythons. I keep my Bothrochilus boa with an ambient temperature of around 28-29 °C (82-84 °F), with a basking spot of around 30-31 °C (86-88 °F). To provide this I use a 150watt ceramic bulb with a bulb guard to prevent the snake from harming itself. For lighting I use 2% UV T5, 0.6 meters (2 feet) long.. 12 hours on, 12 hours off. I provide the animals with fresh water daily. Each day the bottle bowl is cleaned and refilled, whilst this may seem excessive to most i find that these reptiles cannot refuse a drink of fresh water, keeping them hydrated. Water that has gone stagnant i tend to find gets ignored and only used for soaking in! This also ensures that there is no build up of bacteria in the water bowl is a great husbandry practice. I keep the humidity around 60 to 80%, because these pythons have fairly thin skin you should refrain from letting their enclosures dry out. If regular spraying isn’t possible a moist hide or a moss box should be provided. Bismarcks are very food-minded, if it moves – it is a potential meal. If it does not move, it may also be a potential meal too! I tend to feed my adults every 3-4 weeks with a large sized prey this may very from a Rat, a Quail, a Chicken or even sometimes a smaller Rabbit. My younger animals tend to be fed every 10-14 days with an appropriate sized meal. Hatchling animals have very high metabolisms and may have to be fed slightly more frequently. Bothrochilus boa like previously mentioned are very food orientated because of this nature I always handle my Bismarcks with a suitable sized snake hook. I find this creates less stress than me just grabbing the animal out its enclosure and also enables me to control the snake with limited risk of being bitten. Once out of enclosure it is possible to free handle them however I would not totally trust them not to try their luck! 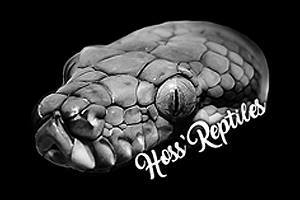 Here at ReptileTalk we recommend Get Hooked LLC for custom made handling tools. Handle your snake with the right tools. I keep my Bismarcks on a bio active substrate, some of my clean up crew contains many different isopods like springtails, dwarf white woodlice and tropical grey woodlice. Because I keep this way, I only have to spot clean as and when the bugs fail to cope. These pythons also have a fairly thin skin so giving them the chance to burrow in a substrate which holds moisture well, enables them to keep them from drying out which leads to healthy ecdysis (shedding).